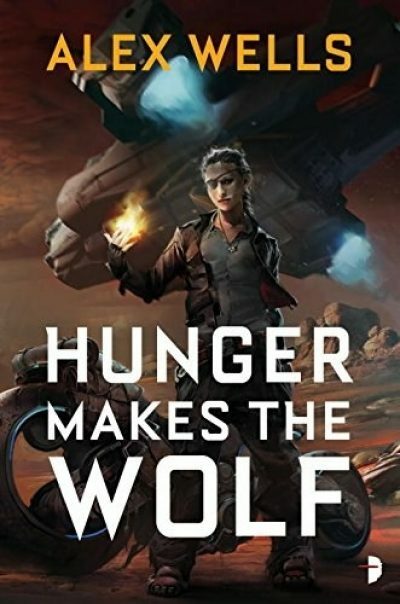 Hunger Makes the Wolf is the first volume in Alex Wells’ as yet unnamed series. Tanegawa’s World is one vast desert; it has very little to offer the other worlds of the Federal Union Moreover, the harsh natural conditions tend to wreck delicate advanced technology far in advance of its expected MTBF. How fortunate for the world’s inhabitants that TransRift, Inc, has taken the planet and its human inhabitants under its wing, providing the able-bodied with full time employment in the mines Without the distractions of decent pay, unions and law beyond that supplied by TransRift’s private army. All of which will go part way to explain why Hob, Coyote, and Dambala find a dead man desiccating in the desert. The dead man is Philip Kushtrim, an unfortunate miner who put himself athwart TransRift by stumbling across information the company would prefer he not have. To compound his sins, he tries to send his daughter Mags off-world to safety. Philip ends up dead in the desert, four bullets in his back. TransRift, being the megacorp that invented and owns faster-than-light travel, captures Mags before she can make it off-world. But the company doesn’t have the high cards in this high-stakes game. The men who found Philip’s body belong to a local mercenary troop, the Ghost Wolves. Led by Phil’s uncle Nick, who is also Hob’s hānai uncle. And Hob used to be BFF with Mags. Hob will not let Mags rot (or die) in company custody. The Ghost Wolves do not have enough firepower or popular support to overthrow company rule, but a daring raid directly into the heart of TransRift’s planetary HQ seems feasible. It is. However, the raid has consequences the Wolves cannot have expected. While the Wolves can hide in their desert redoubt, their friends and relatives in the mining towns cannot. The company is determined to make someone pay for the raid … and they don’t much care if the people who suffer are responsible or just friends of the responsible parties. Or just in the wrong place at the wrong time. This is very much a Space Western but, unlike a certain other Space Western, this isn’t appropriated Lost Causery In Space. The antagonist isn’t the central government trying to force decency on an affronted population. Tanegawa’s World is essentially what a libertarian paradise would really look like; oligarchs and their goons squeezing as much value out of the peons as they possibly can. Prying the company’s hands off the planet will probably require help from the Federal Union. (…) there are hardly any excesses of the most crazed psychopath that cannot easily be duplicated by a normal, kindly family man who just comes in to work every day and has a job to do. The book didn’t really need a monster like the local Weatherman. All it needs is a company focused on fiduciary responsibility to the shareholders and NO responsibility to anything or anybody else. All the abuses we see flow from that. The company has been unusually thorough in its control of the planet. Lacking the means to bug everyone’s home (thanks to the local fragility of much high tech1 ), they’ve opted the next best thing and suborned the dominant religion. It’s not really clear what religion it is (possibly one of the shouty Protestant ones) but it doesn’t really matter since the god it serves is the company. I opted for Joe Hill’s famous quotation as a title but I could just as easily have gone with “people making poor life choices with enormous enthusiasm.” The company could probably get more value from the planet if it treated the locals better. Their policy of punishing complaints as through those complaints were treason may buy compliance in the short run, but it also encourages people to turn to extra-legal means of recourse. This is a book that raises questions like “why gives witchy people their pyrokinesis?” “what exactly is the Bone Collector?” “why is the Company so interested in Tanegawa’s World?” It’s not a book that is particularly interested in giving clear answers. Presumably, that is what future volumes will do. On its own, it was interesting enough that I will be picking up those future volumes. Hunger Makes the Wolf is available here (Amazon) and here (Chapters-Indigo). 1: Which may explain why the company doesn’t use satellite imaging to find the Ghost Wolves.